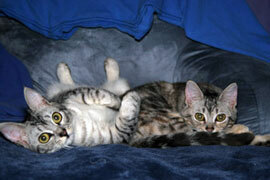 We adopted sisters Luna (silver tabby) and Calypso in September 2007 as young kittens from Feline Friends. 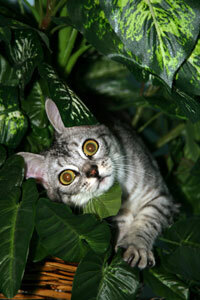 We were very impressed with their unique facility and the spacious, immaculate living quarters for each cat. 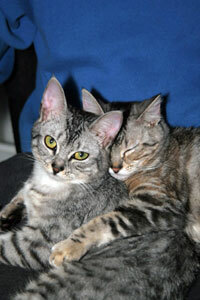 Sisters: They love each other. which they will fetch and bring back to us after we throw it! They often "lose" these balls as a sort of Hide & Seek game and get really excited when we start looking under tables and chairs for them. Calypso is a very acrobatic jumper. 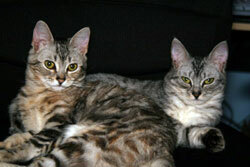 Both cats have adapted quite well to going out on our 32 ft boat with us, calmly exploring everywhere inside the cabin. They turn one on July 4th. We love them dearly!